So the story basically goes like this: Banshee is in Europe on the hunt for a sinister group called Factor 3. He discovers their hidden lair, but is attacked and defeated by a spider-like robot. Before he is captured, he manages to send a message to the X-Men about his discovery, and tries to warn them about the robot, but the message is incomplete. . .just telling them to "Beware the Spider". As the X-Men ponder the mysterious message, Peter Parker (AKA Spider-Man) has chosen that EXACT time to take a motorcycle ride out in the country, where he is attacked by a Spider Robot that Factor 3 sent to recon how much of a message Banshee was able to get through to the X-Men. While he is fighting the robot, the X-Men get an alert from Cerebro about an evil mutant nearby. They rush to check things out. Spider-Man defeats the Spider Robot and it self destructs just before the X-Men arrive on the scene. It quickly turns into a classic "Heroes battle each other until they discover that there's been a mistake made" situation. Spider-Man hilariously and easily defeats the entire (well. . .almost entire. Jean Grey stays back at base to monitor communications) X-Men team single-handed before they get a message from Jean telling them that the message was incomplete and that Spider-Man isn't the enemy. They all sort of apologize to Spidey and then take off in Professor X's Rolls Royce, leaving Spider-Man standing there wondering what the hell just happened. The X-Men get back home and start making plans to head to Europe in order to rescue Banshee. The End. . .To be continued. Okay. So let's break it down a bit. . . Overall, a pretty simple story. 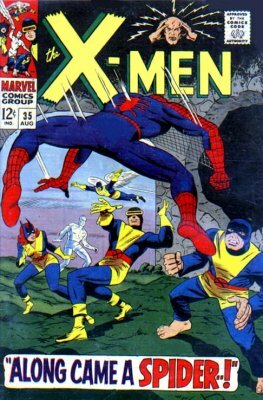 Mostly an elaborate excuse to get Spider-Man into an X-Men comic, as far as I can tell. The story is pretty much propped up by a string of improbable coincidences and extreme stretches of comic book logic. It seems like they were struggling a bit to get this crossover done and still fit in with the ongoing story being told (Professor X is missing, kidnapped by Factor 3). Not that the writing is bad. Roy Thomas does a fine job with the dialogue, especially during the fight between Spidey and the X-Men. It's really entertaining in that bombastic early Marvel way. It's just that the PLOT itself is forced and even somewhat confusing. Spider-Man picks the EXACT day all this is going down for a quiet day in the country, AND he ends up in the EXACT spot the Spider Robot lands. Cerebro can distinguish between good and evil mutants? Cerebro can detect a ROBOT made by a mutant? Jean JUST happens to find Xavier's note about putting a special crystal in Banshee's headband that can be reached by adjusting Cerebro's frequency? So on and so forth. I haven't read a LOT of these older X-Men issues, but I have to wonder if Cerebro was used as such a Deus Ex Machina crutch as often in other issues as it was in this one. . . But like I said, it's not all bad. I thought it was great how the X-Men had to drive around in a borrowed car, and how Spider-Man was basically spanking the whole team single-handed before they were like, "Sorry, our bad." and took off, leaving him standing there by himself wondering what just happened, and thinking the X-Men were a bunch of nuts. I actually got a pretty good laugh out of that. So that was the story. What about the art? The cover of the book is fantastic! It's bright, energetic, and hits all the marks for a classic Marvel cover that I'd want to put in a frame on my office wall for my rotating comic art collection. The interiors are. . .decent. Not bad, but there's nothing very inspired about it. No panels stand out as being particularly impressive. The art tells the story just fine, but it doesn't try any harder than that. There are also a few pages with some sloppy coloring, but not nearly as bad as other comics from the same time, and so they don't really distract from the overall picture. If I had to use one word to describe the art in this issue it would be "Workmanlike", even though I'm not sure if that's even a word. The artist did their job, but that was it. All in all, I liked this issue. Sure, the story was contrived and extremely forced, but it had some good moments. The art was okay, and the issue has a very nice cover. What more could you ask for in a 50 year old comic book? I've seen issues of more recent comics that make this one look like a masterpiece, so it speaks to the quality of Stan Lee era Marvel comics that this issue still stands up and entertains after so many years. Despite its faults, it's just plain fun! Back to Longbox Junk business as usual with the next 6 issues of DC's Deadly Fish Out Of Water tale, HEX. Be there or be square! The Avengers #130 Marvel Comics Dec 1974 Bronze Age Vf!!! Venom #150 Oversized 150th Issue Spectacular!